When it comes to trying to get in lots of healthy veggies, I always struggle! They sound good, but a salad just doesn’t sound satisfying enough. And I’m craving warmer heavier foods. 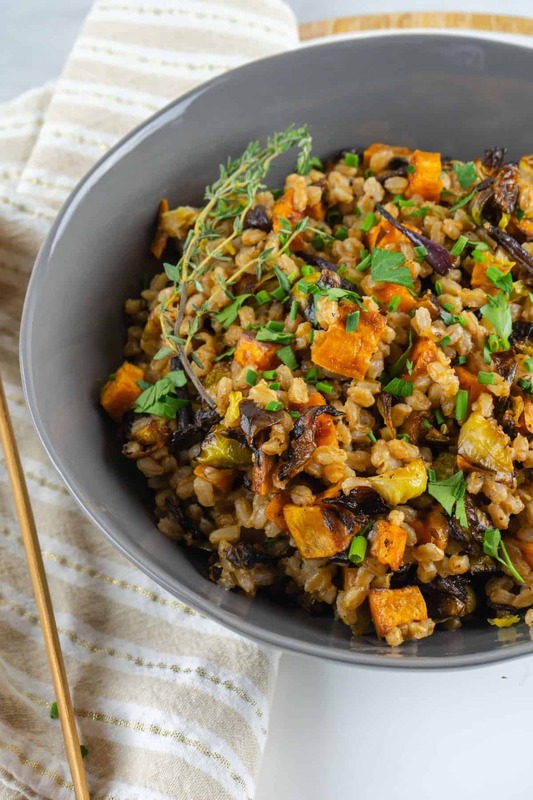 So when I’m looking for a veggie-packed side dish that’s also super filling, this Warm Farro Salad with Roasted Sweet Potatoes and Brussels Sprouts is where it’s at. I just love a good grain salad… equal parts healthy, packed with nutrients and really delicious. Plus, it’s warm, so you’ll be entirely satisfied, even on cold winter days. And it’s pretty enough to brighten up any gloomy day with the bejeweled colors of the winter vegetables. But you can also feel free to play around with the roasted veggies based on whatever’s in your fridge! Broccoli, kale, peppers, leeks, butternut squash or asparagus would all be super tasty! If you’d like to make it a full rounded meal, I suggest tossing some roast chicken or chickpeas on top! 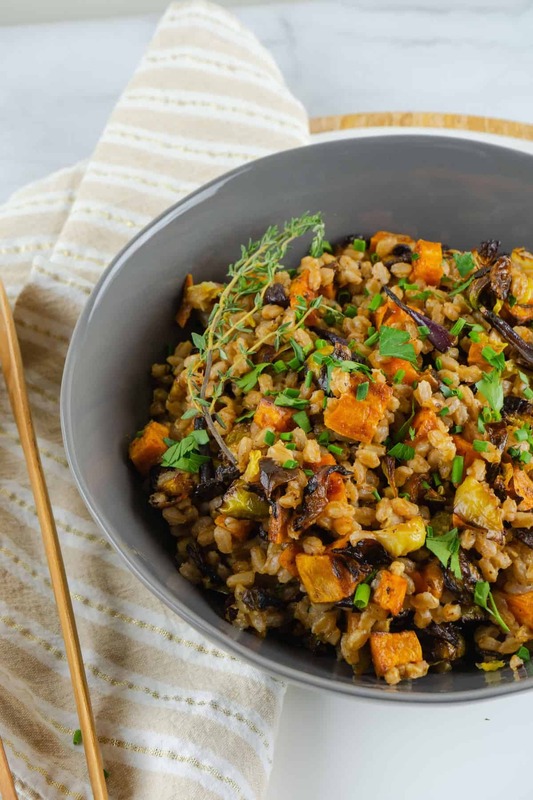 I love making this warm farro salad in a big batch to serve with a dinner, then eating on it for lunch throughout the week. It’s super filling and doesn’t leave ya feeling like you need to take a nap. On a sheet pan, spread out the diced sweet potatoes, cut brussels and red onion. Drizzle with 2 tablespoons of the olive oil and toss to coat. Roast in the oven for 15 minutes, then toss with a spoon and finish cooking for 10-15 minutes (depending on your desired crispiness. In the meantime, in a medium sauce pot, heat the remaining olive oil over medium heat. Add the crushed garlic and let cook for 1 minute until fragrant. Add in the farro and stir. Let cook for 2 minutes, then add the broth, salt, dried thyme, pepper and dijon mustard. Stir well and bring to a boil. Return pot to a simmer, then cook for 20-25 minutes until liquid is gone and farro is cooked through. Add the roasted vegetables to the farro pot and stir well. Serve in a bit bowl and top with fresh herbs, if desired!